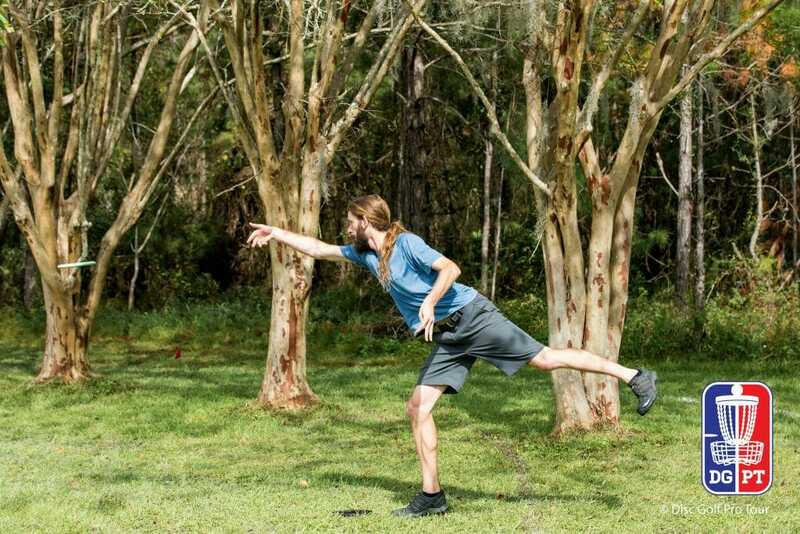 JACKSONVILLE, Fla. — After 15 holes at yesterday’s Disc Golf Pro Tour Championship semifinals, James Conrad was on the verge of elimination. Despite playing a relatively clean round — he’d only logged one bogey, jammed a 40-footer for birdie, and hit the green 60 percent of the time — the tournament’s 5th seed was still one shot behind Simon Lizotte and Philo Brathwaite. That pair was in line for the last two berths to the finals if their results held, and they weren’t showing any chinks in their armor. 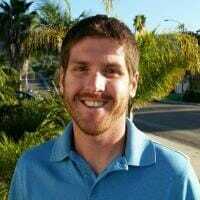 But a little luck — both good and bad — and just plain execution saw Conrad emerge from the fray four holes later with the wild card spot into today’s final round at New World Disc Golf. First, the good luck. Conrad’s drive on 265-foot 16th, one of the more tightly wooded at the Jacksonville track, bent late and somehow squeaked through a left-side gap to nestle into the pine needles 15 feet from the pin. He tapped in for a much needed birdie, and Brathwaite did the same after his own snaking line. Lizotte, meanwhile, clanked off an early tree and couldn’t make his birdie from 100 feet. With two holes to play, Conrad was tied with Lizotte, but still trailed Brathwaite. Then, the bad. Conrad was second to tee on the 495-foot 17th, a sharp left-hander that plays downhill but requires an aggressive hyzer to stall out late. He attacked, galloping toward the tee with every inch of his 6’3” frame and letting out an audible grunt as he launched his drive high in the sky. As it plummeted toward the earth, it struck one of the guardian trees outside the green, the rolled 70 feet in the opposite direction. It was a poorly-timed setback, and Conrad expressed his disbelief to his cardmates. But he shook it off before giving his birdie run a solid bid and ultimately taking a par. Lizotte canned a 25-foot birdie putt after his own towering tee shot, while Brathwaite couldn’t convert on a deuce from 60. The roller coaster continued, but this time Lizotte was at the top and Conrad and Brathwaite were knotted up. Even with the misfortune, the mild-mannered, hirsute Virginian kept his cool. Faced with a daunting par 5 to end the round, all three competitors dialed up aggressive drives. Lizotte did what he does, putting a roller 450 feet up the fairway on the way to a card-clinching birdie. Brathwaite kept an air shot underneath the low canopy and ended up right, while Conrad opted for his own roller that veered left and into the brush. Conrad was stranded, but was placed well up the fairway from Brathwaite. And that’s where there was finally a crack in the door. Brathwaite, aiming for the hole’s late-fairway double mandatory, yanked his shot right before it clipped a branch and landed safely. Conrad then took to a knee and put a hyzer recovery short of the mando, but with a wide look to the green. Brathwaite’s lie was much less convenient. With no easy angle to clear the mandatory, he pitched up to the middle of the fairway. Conrad put his third shot on the green, as did Brathwaite for his fourth. The pair connected on their putts from 25 feet, and it was playoff time. As they stepped up to play the 408-foot 1st again, DGPT Director Steve Dodge laid out the scenario: Conrad and Brathwaite would play three holes in sudden death. If they were still tied, Conrad would move on, as he finished the season higher in the series’ points standings. That bit of insurance provided Conrad with some comfort on a hole he did not birdie the first go-round. He put his drive to 25 feet, and the pressure was on Brathwaite to execute. The Southern California pro smacked a tree and careened out-of-bounds, though, leaving Conrad to move on to today’s final round. The appearance is a fitting end to the 27-year-old’s season. He made noise by forcing a playoff at the tour’s second event, the Waco Annual Charity Open, before raising it to a cacophony with his Idlewild Open triumph over Paul McBeth. Though he was confident in his skills entering the year, even he did not expect this kind of breakout. Now he just needs it to work for one more round. Comments on "Conrad Comes Back For DGPT Wild Card Spot"